Have you ever needed to run your VPN traffic across one ISP link and all your Internet (youtube, ESPN, etc) traffic across your other ISP link? I came across a customer that wanted to do just that. They wanted to keep the two types of traffic separate from each other. They wanted the DSL link to host the VPN traffic and let all other web browsing have the T1 link. As you know, the ASA does NOT do PBR (policy based routing). So, how do you overcome this small detail? Through static routing. Thats the only way to do it. So you can 'cheat the system', so to speak, by doing static routing. But if you do that, you can forget ISP failover. So below is the topology and some highlights of the config to show you how to do this. You don't have to completely forget ISP failover. I have a system running a similar config with full failover capability. In order to accomplish this, I had to set up a back-up VPN and multiple SLA's: One for my internet ISP at site 1, another for my VPN ISP (icmp to site 2) at site 1, and yet another for the VPN connection at site 2. Internet traffic is rerouted to the next available route, which is my VPN ISP. VPN traffic is rerouted through back-up VPN over internet ISP. 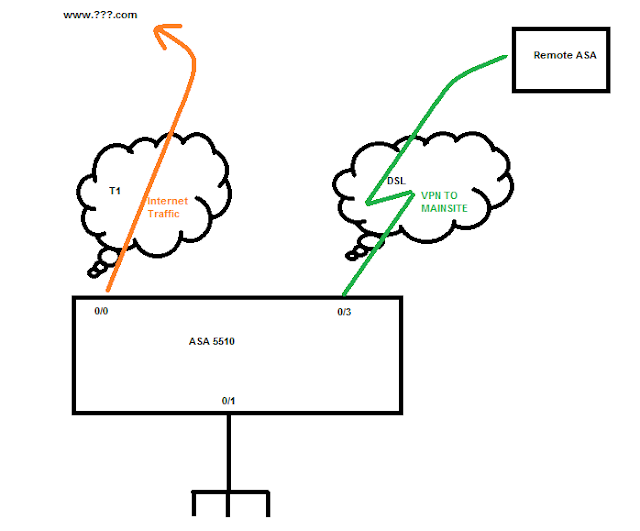 Site 2 shows no connectivity on primary VPN and reroutes VPN traffic through back-up VPN. Might I add that site 1 also has redundant ASA's... This was a headache to get right, but now it's a thing of beauty. Downtime in any given failover situation is about 3 seconds. Mike, great info. Thanks for sharing. Great job Mike. But I think it could be more easier for learners if you mention remote IP details along with design, here ACL and routing part is bit complicated for learners. And hopefully interfaces which are allocated for internet and VPN is wrongly configured to other interfaces, if we consider above diagram. That pretty much is the full config.